Shrubs, Shrubs, Shrubs, Shrubs, Shrubs! 9-3-06 – Talking with a prospective client several years ago as we walked his newly acquired property in spring, he said something that crystallized in my mind just how long – and wide – is the learning curve for landscape design. This was a large, pricey property in the far southern suburbs of Minneapolis. 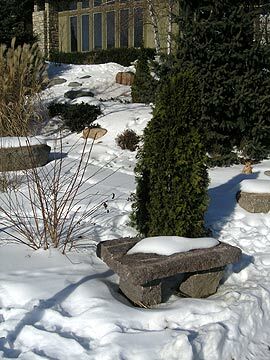 Purchased in early winter, the homeowner was seeing his landscape come to life for the first time. The previous owner had invested heavily in perennials, and near the front door a very large, robust, old-fashioned bleeding heart (Dicentra spectabilis) was in full bloom, as gorgeous as any perennial you can grow in a garden. That would be a distance of about fifty feet. This was a man who was smarter than I, or at least smarter in a number of important ways. Smarter at business, for instance, since he was several years my junior yet was making more money as an upper executive for a Fortune 500 company than I’ll ever see. I don’t have half the analytical skills needed to perform his job, let’s put it that way. Attempting to do what he does, I wouldn’t last fifteen minutes. As his comment hung in the air, my mind was racing, sorting and shuffling through a dozen possible responses, attempting to concoct some semblance of a reply that would, a) applaud his acute design acumen, and secure my company the job, while, b) not convey to him that doing as he suggested would be the stupidest thing in the world. You see, there are four terrific reasons why you don’t plant a single string of bleeding heart along the front of a house and rely on them as the sole plants in the foundation planting. First, bleeding heart blooms for about three, sometimes four weeks, gorgeous, you bet, but then it’s done. He didn’t know that, and assumed that this colorful knockout would be in bloom from spring to frost. 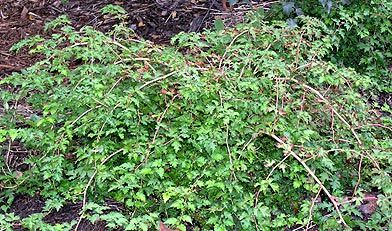 Second, bleeding heart foliage, also very attractive in spring, tends to look like hell by about August 1st, unless you keep plants well watered, and even then, during very hot summers, plants can wither away and die off to the ground. If this were to happen, his foundation planting would consist of a narrow, fifty-foot strip of shredded hardwood mulch, or, a narrow, fifty-foot strip of crushed gravel, if he really screwed up and went with the lowest bid. Third, a single string of bleeding heart – or any perennial, for that matter – along the front of a house isn’t going to nestle the house in nature. To nestle, you need height, and breadth. Use only perennials around the foundation, and you get what I so often refer to as a doll house sitting on a pool table. This was a big, tall house – a tight little tutu of bleeding hearts in front isn’t going to make much of an impression, even during the three weeks when the tutu turns pink. Three-foot-wide bed or no three-foot-wide bed, you have to toss in something on occasion that will grow taller than a couple feet, to help knock the height of the house down. 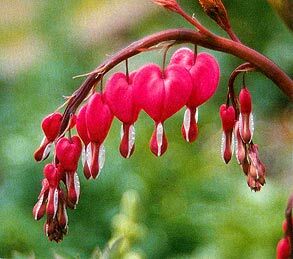 Fourth, relying on bleeding heart as described would mean that from September (if you were lucky) until late April – a period of seven months – you wouldn’t have any foundation landscaping at all. But here comes my confession: I used to think the same as he. Dicentra spectabilis, coincidently, was one of the first perennials I planted twenty years ago when I bought my house. And about four years later (I bought them mail-order, honest to God, puny little things) when they had finally matured to big, robust specimens, I was still at the point on the learning curve where I easily could have looked at them in late May and thought, hey, now I’m on to something – let’s ring the house. I’m not admitting this in an attempt to diminish the small number of e-mails I receive each year from people who stumble upon my website, read a few items, then fire off a hostile tirade accusing me of being a snide, cynical, elitist snob. I KNOW I’m a snide, cynical, elitist snob, save your zeros and ones. Rather, I’m admitting this to make my point: The learning curve, when it comes to gardening and landscaping, continues its rise over your entire lifetime. That’s part of the hobby’s great allure. 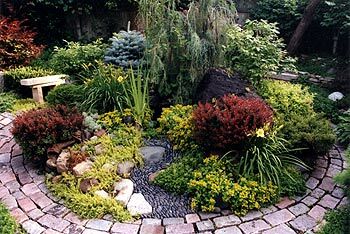 And at some point on the curve – different for everybody – you’ll learn that one of the basic, basic keys to creating an attractive landscape is to incorporate ample amounts of shrubs (and small trees, for that matter) into the overall design. I didn’t figure that out until tens years ago – after ten years of hot and heavy gardening. My first ten years of gardening, my plodding, decade-long attempt at creating a pleasing landscape, I thought the whole point of the exercise was perennials, perennials, perennials. Plus annuals, annuals, of course, “essential for their season-long color.” (Early in my writing career, I wrote those very words, dozens of times. You might find one of those old articles on this site, if it had a damn search engine.) My world was bloom color. Flowers. What else was there? 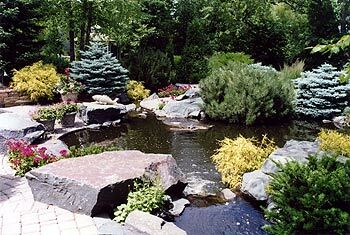 It’s the right small trees and shrubs, well placed, that will command the most attention. The gold evergreen is Chamaecyparis pisifera ‘King’s Gold.’ Think of perennials and annuals as the colorful throw pillows on an expensive, gorgeous couch. If you want a colorful garden area of nothing but flowers, great. Create a big couch. Of course, I was aided and abetted by a gardening industry that gorged my mailbox with flower catalogues (quick, how many catalogues did you receive this year devoted to shrubs? ), magazines with colorful covers touting the hottest new perennials and annuals, and garden centers with the flowers running from the front parking lot to the rear of the greenhouse – with the shrubs, if any, banished to the back forty. Sales of perennials and annuals, you see, make up a vast majority of the nursery industry’s profits. The pots are smaller, so garden centers can fit in many more perennials and annuals than trees and shrubs, and profit margins are greater, particularly on annuals, which have a profit margin equal to a venti cappuccino. Then, one day, click. I don’t know exactly when, I don’t know why, but I do know how: by studying truly fabulous gardens and landscapes, in person and via books and magazines, and asking myself, why is this landscape so spectacular? Without fail, the answer was: ample incorporation of shrubs. Shrubs (and, one more time, small trees) serving the landscape as the backbone, or as the middle bone, sometimes as the front bone, and occasionally, in the hands of someone who’s developed a great eye, as the funny bone. In landscape design, foliage color, shape, size, and texture are key. Next up is plant form, the shape of the thing. It is in contrasting foliages of plants and then – graduate school – contrasting their forms, that activates beauty in a landscape. Plant flowers in front of a wood fence, you have flowers in front of a wood fence. Plant a flowing mosaic of shrubs in front of the wood fence, then plant flowers in front of that, and you have a garden. Bloom color is a tertiary consideration. 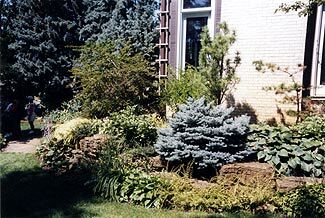 But the landscape benefits from it, so if you desire it, start with shrubs. 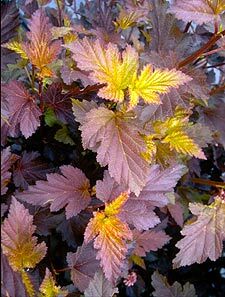 There are hundreds (thousands, if you want to count each and every variety) of diverse deciduous shrubs we can grow in the north that will give you spring bloom, mid-summer bloom, fall bloom, even season-long bloom. In addition to colorful blossoms, many, many shrubs will give you spectacular fall leaf color, yellows, golds, oranges, purples, reds. In the fall, perennials, with the exception of about three, won’t give you much more than green racing to brown. Annuals will give you only a last gasp. Shrubs exist in the midrange size of plants used in landscaping, most of them taller and wider than perennials, with a majority of shrubs ranging from three feet to twelve feet high, and from three feet to eight feet wide (there are exceptions, of course). 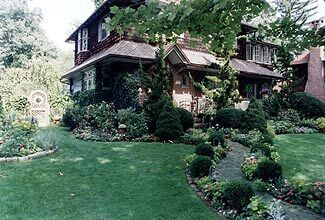 These are the plant sizes we need to transition in height from two inches of grass and two to three feet of perennials and annuals up through fifteen- and thirty-foot rooflines and forty-, fifty-, and sixty-foot tree canopies. Use just a few shrubs here and there, it’s tough to create enough visual mass and interest across this crucial, three- to fifteen-foot range. So where do you plant shrubs? That’s up to you, kids, you know me, I don’t tell you nothin’. You plant them where they look good to you, you develop your own style. They’re good in the foundation planting around your house, that’s a given, because your house is a big, lumbering, unnatural thing, packed with straight lines, vertical lines, horizontal lines, ninety-degree angles, and a bunch of other stuff that doesn’t exist in nature, like satellite TV dishes and central air conditioning units. But you don’t want to replace a little tutu with a big tutu; swing your foundation plantings out and away from the house, send the shrubs out to connect up with trees in the yard, to give structure to an island perennial bed, or to hide your neighbor’s dreadful chain-link fence. Shrubs are vital to northern landscapes because they don’t disappear after a few hard frosts. In winter, many deciduous shrubs are elegant, living sculptures that retain colorful berries, intriguing bark textures, and graceful branching habits that catch the snow. 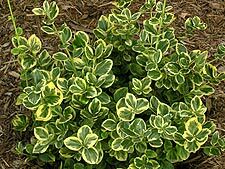 Then there’s the vast world of evergreen shrubs, those year-round anchors of the landscape, essential to northern yards for their winter contribution of green, blue, yellow, and gold. Find a house with a yard in your neighborhood that features flowers, flowers, flowers, then find another that features a solid collection of shrubs plus flowers, flowers, flowers, and you’ll immediately see the difference. Then take a look again at each in February. Case closed. 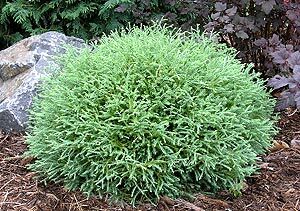 Features: Powder blue foliage similar in texture to rosemary. Light pink flowers in May followed by a fruit capsule. Full sun to part shade. Moist, cool, acidic soil. 2′ H x 3′ W. Zone 2. 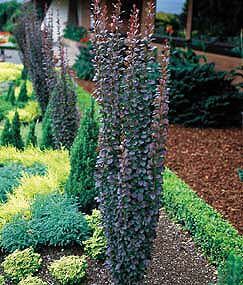 Features: Deep crimson foliage, narrow, upright (pillar-like) form. Full sun. 4-5′ H x 30” W. Zone 4. Features: 2006 introduction (U of MN, hats off to thee). Bright chartreuse to golden foliage. Light reddish-pink fall color. Red winter stems. Best performance in light shade. 5′ H x 5′ W. Zone 4. Features: Bronze-green foliage, fast-growing, arching spread. Yellow, trumpet-like flowers in midsummer. Bronze-red fall color. Full sun to part shade. 3-4′ H x 3′ W. Zone 3. Features: Light green leaves with yellow margin. Semi-evergreen. Sculptural habit. Full sun to part shade. 4′ H x 3′ W. Zone 4. Features: Dark green, rugged foliage. Fragrant, white, bottlebrush flowers in spring. Fabulous yellow, orange, red fall color. Full sun to part shade. 5-6′ H x 3-4′ W. Zone 4. Features: Rosy-red spring foliage with yellow center, maturing to burgundy. Round clusters of small white flowers in early summer. Full sun to part shade. 8-10′ H x 8′ W. Zone 4. Features: Dark burgundy foliage. Round clusters of small white flowers in early summer. Full sun. 6-8′ H x 6-8′ W. Zone 3. Features: Graceful, low, spreading habit. Delicate foliage tinged red-bronze turning green as it matures. Ample, small white flowers in spring. Red-orange fall color. Full sun to part shade. 2-3′ H x 5′ W. Zone 4. Features: Chartreuse spring foliage turning yellow-gold as it matures. Pinkish-red stems and veining. Terrific, sculptural form. Yellow-orange fall color. Bailey Nursery ( St. Paul, MN) introduction. Non-suckering. 6′ H x 6′ W. Full sun to part shade. Zone 4. Featues: Graceful, arching habit. Salmon pink stems and buds with light green leaves mottled with pink and cream. I mean, come on. Often dies back in winter but reliably generates fresh new growth in spring. Part shade. 4-6′ H x 4-6′ W. Zone 4. Features: Fine, thread-like, blue-green foliage very soft to the touch. Intense plum color in winter. Prone to some winter burn if not grown well and screened by burlap first winter. Full sun. 4′ H x 4′ W. Zone 3. Features: Yellow-gold, Rastafarian mop-top foliage winter and summer. Currently my favorite shrub in all the world. Full sun. 30” H x 4′ W. Zone 4. 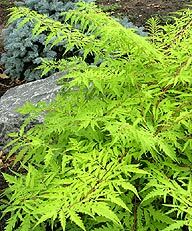 Features: Unique green foliage with contrasting white new growth in spring/early summer. Good soil, keep it moist. 3′ H x 3′ W. Zone 4. Features: Neat pyramidal shape and bluish-gray foliage that retains its color year-round. Full sun. 12-15′ H x 4-6′ W. Zone 4. 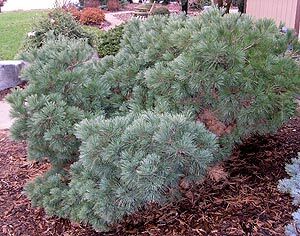 Features: Soft, blue-green needles, billowy shape. Easy to contain and shape into erratic form. Full sun, although five hours of direct midday sun suffices. 4-6′ H x 6-8′ W. Zone 3. Features: Spreading yew with sunny yellow foliage. Part shade. 3-6′ H x 5-6′ W. Zone 4. It’s official and certified … my seven-week run hosting The Renegade Gardener Hour on a local Twin Cities radio station is the shortest paid stint in the history of broadcasting. And that’s saying something – Alec Baldwin lasted longer than I did, and he was facing the impossible task of making sense of his psychotic socio-political hallucinations to all fourteen of his listeners. The sponsor hated me, hated my bumper music, hated my content, hated my irreverence. To be fair to them, this WAS a full-hour sponsorship, i.e., a “paid” program. There are two kinds of radio shows. The most common is standard format, where the station conceives the show, then finds a host that they think will attract listeners. They lose money at first, but if the show starts gaining listeners, advertisers and revenues follow. The second way radio shows come into being is the station finds (or is approached by) a sponsor (in my case, a local nursery) that is willing to sponsor an hour on the station. The station then finds a host, the host, the station, and the sponsor brainstorm on format, and the show debuts. 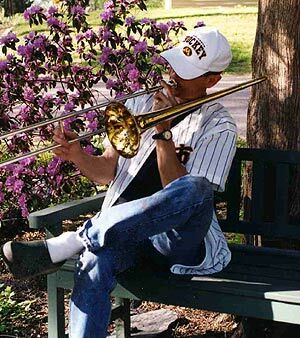 The Renegade Gardener plays the blues. The sponsor visited my website, we all agreed that “Myth of the Week,” “Don’t DO That,” and “Plant Spotlight” would make great regular weekly features, that I would have cool guests, jam on the intricacies of gardening, not try to dumb it down, stray outside the box, not do call-in, etc. And the first few weeks went by with good feedback from all fifteen listeners, and without any great negative feedback from the sponsor. About six times per hour I had to mention their name and say how cool it was that they were the sponsor, but hey. So I had Nancy on, it was a great show, she is the best, but we could only talk about shrubs people could find at the nursery. I used rock bumper music – the five or ten seconds of music played going into and coming out of breaks – and pop, and jazz, and soul, because people who are spending money at nurseries are in their thirties and forties and fifties, and listen to rock, and pop, and jazz, and soul. Good stuff, too, White Stripes, Stevie Wonder, Charles Mingus, Dylan, Kinks, Al Green, Los Lobos, David Bowie, The New York Dolls, Aretha Franklin, Outkast, all the people I like. But they wanted … well, I never quite figured out what they wanted. I saw the handwriting on the wall when we were in a planning meeting and they were looking ahead and mentioned that in June I’d be out at their nursery during their big water gardening pond sale. I was supposed to be there live, talking up their huge selection of wonderful pre-formed ponds, you know, the black plastic kiddie pools that everyone buys for their first pond before discovering they’re too small and look like hell, then have to rip them out, and make a real pond with a rubber liner. I wanted to point out to them that friends don’t let friends do plastic ponds, but I was in enough trouble already. So after seven weeks, discretion being the better part of valor, I agreed that a change in host would be for the best. . They are a very fine nursery, and do a beautiful job with annuals, perennials, trees and shrubs. Bottom line is I wasn’t delivering what the sponsor wanted, and that was my job. But you know me, I consider everything a feather in my cap, and want to thank all the comrades who dutifully tuned in, and gave me positive feedback. Funny thing is, the station liked the show, and liked the fact that they were offering a real alternative to the usual, staid, cue-the-classical-music, it’s time to listen to call-ins about what’s eating holes in the leaves of my hosta-style radio gardening program. Most important, I learned why my gut instinct, to not accept commercial advertising on the Renegade Gardener website (even though I’d then be able to afford a search engine), was correct.